In a few sentences, tell us a little bit about your blog. 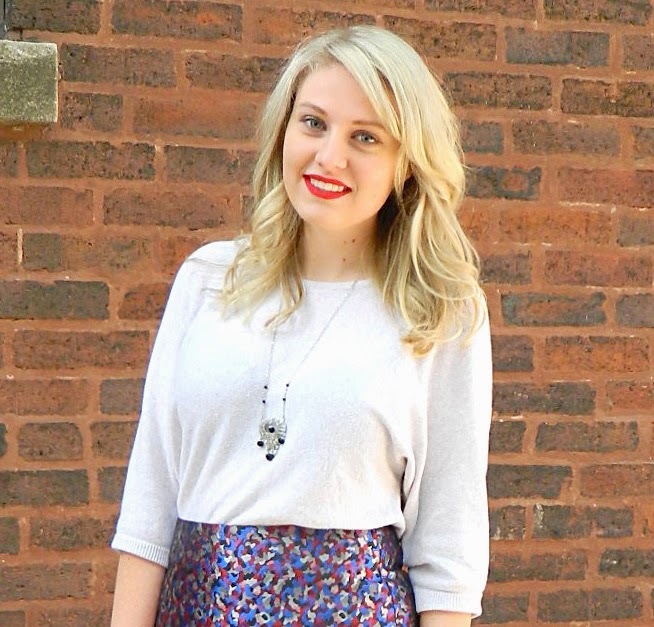 I’m a twenty-something lifestyle blogger focusing on fashion and food in the city of Chicago. 1. Favorite meal, food, or cuisine: My favorite meal is a bit strange, but I could eat chicken noodle soup every day of my life. 2. Least favorite meal, food, or cuisine: I’m actually not a fan of Indian cuisine. 3. Favorite restaurant in your city: I love Southport Grocer & Cafe - especially their bread pudding pancakes. Delicious! 4. Favorite restaurant outside of your city: I spent a few weeks in San Sebastian, Spain and I loved this small tapas place called Astelena. 5. Favorite food memory. I come from a large Polish family and throughout my lifetime my parents and grandma have always made super delicious meals. I always wanted to help out in the kitchen so I was in charge of making a cucumber salad for dinner - my cucumber slices were always to thick but it was delicious anyway. I’m still in charge of making that dish every time I’m home. 6. Favorite guilty pleasure food: I love mini M&M blizzards from DQ - I used to eat one everyday in the summer. 7. Favorite ingredient (something you love to cook with, or something you see on a menu and know you have to order): BBQ sauce - all kinds. I can honestly put it on anything and always order food with bbq sauce on it. 8. Favorite kitchen tool, utensil, product, etc. : I love rubber spatulas and prefer to use it in all my cooking - I own like 25 rubber spatulas. 9. Favorite recipe: I make these Rocky Road Chocolate Chip cookies during the holidays - they are worth every single bite! 10. Favorite thing about blogging: Having a creative outlet is the best part of blogging and I love the friendships that have come from meeting other bloggers.